This level has hard difficulty. For this level try to break candies as you get the chance and as you have more candies to play then try to make striped candy. Or play near to ingredients to take it to the bottom. 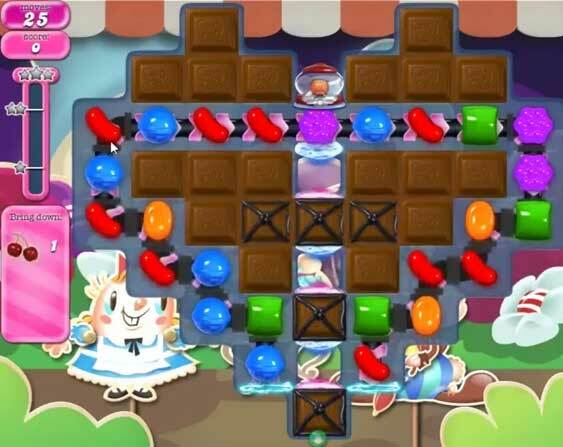 Try to play more from middle of the board where more candies available to play to make special candy. Or take help from the walkthrough video that is below. Just completed this level it was straightforward with the help of a coconut ring ? Haven’t been able to get through this one. I will get all the chocolates, everything is done… and even got a striped candy to make the cherry go down… but guess what; I used a hammer, switch places and still won’t go down. I’ve had enough of candy crush. Too much of a rip off. Wont even get back to me when I’ve emailed them. This level is gunna make me not play candy crush anymore. This is the most boring candy crush game I’ve played. Sometimes you get 1 move and the game ends. 1232 makes me want to quit playing candy crush! I love Candy Crush but level 1232 is beyond passing. I am so disappointed that I have come to a stand still on this particular game. Just wish they would give us games that us old people can pass. How do you get the bottom Licorace choc out ??? This level is impossible to beat. Don’t even feel like playing anymore !!! I hate the chocolat games and i hate the CC games. No matter they give me spare time by the treasure, i am not playing anymore. ITS a fu**ing sh** game. Nearly two hours free time to play and i already give up, not my game. ?? As i see all comments, i am done with this level also. What a fu**ing losing game. Is CC still proud? On what? Losing players? HahA?? Candy crush is for me the end, I don’t care how many levens they have. I reach level 1232, believe me not to do, I camera far enough, I am done with this fu**ing game. Haleullah.? 1232 is unreasonable. Wasted multiple free candies and had a two hour freebie without success. Nothing about this level is intuitive and read many posts. Just not right and shame on me for continuing to try! Where is the tooth fairy? This level is IMPOSSIBLE. I’m all for a hard level that takes a few days and a bit of money but with this level, none of that helps! I love this game but something needs done about this particular level. Leaves you with just one move everytime. I love challenge and strategy but this one leaves me with no option at all. I move what is the only move possible. Am I the player or am I a dummy doing the only option the game provides? I’ve used up all available help I did. Oh no no no no, I’m not buying. I refuse to be ripped off. Candy crush will loose another loyal player. THIS LEVEL IS SIMPLY UNFAIR! I’d gone thru 25 rounds of this and read the above comments and was going to give up. BUT I had a coconut candy so I thought 1 more try. I got it to the top of the conveyer and positioned it so the last stripe would go down the middle. that made my cherries land in the 2nd level. Then I had a stripe on the left side of the 3rd level. I hammered than and the cherry dropped just above the last chocolate square. I hammered that and voila! i had 8 moves left! Everybody…it can be done! I played this frustrating level for 5 days – and it most certainly IS the most frustrating level thus far – and then I finally got a somewhat “lucky” board, where I was finally able to move the cherry down the middle column early on, but the one chocolate below the conveyer belt was still there. I again studied the board. I had a striped & wrapped candy with 2 candies between them – with 2 moves left. I had no hammers left, so I used 2 of my 4 “hands” to move over. I mixed them and was finally off of this absolutely hardest level thus far! I’ve never purchased any helpers from CC, as I’m a cheapskate. But keep plugging away, go slowly, look around the entire board before each move, and you’ll eventually get your “lucky board”! Good luck with what I call this level – Satan’s Spawn!